Thanks for the analysis coach. Much appreciated as always. Pretty pedestrian performance by our guys but I'll take the win. On to the Iron Bowl and ROLL TIDE!!!! Just a game that we'll forget. The Citadel left the field happy, Saban was pissed, and we had a few unnecessary injuries. On to the Iron Bowl. Thanks Coach. Pretty much sums it up. Seems like the cupcake game before the Iron Bowl is a letdown game like this, more often than not. The Georgia Southern game in 2011 really sticks out to me. Seems like we did ok the rest of that year. I have learned when it comes to college football I could not pick my nose right. RTR! Citadel attempted only 1 pass, which might be the reason for no passing yards. What injuries are you referring too besides D Harris? Coach -- Thanks for your game notes from all season. Always insightful. Injuries per CNS post game presser:  Damien has a "mild concussion." I think he is probably in a concussion protocol and to some degree doubtful for IB. Deonte T has a "bruised knee". He was hit by a cut block near the end of the game. (da#@ those cut blocks.) Alex Leatherwood has a "twisted ankle" (whatever that means.) He did not play in the 2nd half which was part of the OL's problems. I hate these cupcake games. There is no upside to them. There ought to be a better alternative but I don't know what it is. I know. We could schedule Ohio State in this slot and come out with fewer injuries. Thanks for injury info. I didn't know about Leatherwood, even though I saw Cotton on the field. I was on the road part of the game & listened on radio. Coach - thanks for your analysis. The most concerning part of the game to me was a lack of push by the OL, as you mentioned. The line play (or at least our success running since I don't break down film) really seems to drop off when Brown is replaced by Cotton. They don't seem to communicate and play as well together as a unit, which is odd considering Cotton has started more games with the rest of the lineman than Brown has. Do you think it's just lack of ability, or are you seeing the same thing that I am in that there seems to be communicate/assignment breakdowns when Cotton is in. Maybe lack of trust? Also, I saw someone else mention that playing a team like The Citadel right before Auburn could have some benefits for the defense. Mainly, and this goes to what Coach Saban said in his pre-game interview with Eli, is that the most important aspect of defending their style of offense is the D having good eye discipline. Don't get distracted, follow the ball, play your assignment. While Auburn doesn't run the triple option, their offense is designed to fool the defense. Try to get the D to lose the ball long enough that they're out of position. What do you think? I think there is a drop off when Cotton is in. However, against a team like The Citadel it should not have mattered as much as it did. It is really tough to determine who messed up when you don't know their rules for each running play. I know if we had a certain running play called and the defense lined up in certain techniques, calls were made to change some of the blocking schemes. I do agree with you about The Citadel does offer some eye candy which could be beneficial to the defense. Hopefully, the film sessions could help point out several mistakes. 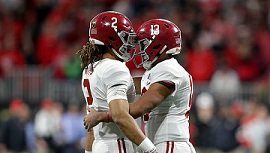 It almost looked as if, in the first half, Bama was playing tentative as not to get hurt or expecting someone else to make the play before it got to them.